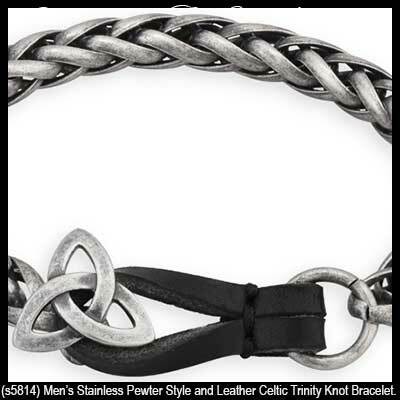 Men's pewter Celtic bracelet features the Trinity knot along with a snake chain. Sorry, this Celtic bracelet for men is now sold out. This Celtic bracelet for men, like all the Irish made jewelry at The Irish Gift House, is nickel free and hypoallergenic. The Celtic bracelet for men features a 3/4" wide x 3/4" tall Trinity knot and the snake chain design measures 9 1/4" long including the black leather clasp. 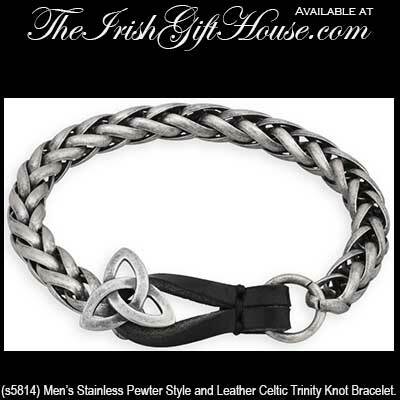 The men's bracelet is made of pewter style metal and it is gift boxed with a Celtic knot history card, complements of The Irish Gift House. The bracelet is part of the Celtic Man Collection from Solvar Jewelry and it is made in Dublin, Ireland. Celtic bracelet for men is an engraved stainless steel bangle with a hinge. Claddagh bracelet for men is a pewter design with a dog tag style emblem. Men's Celtic bracelet is crafted of stainless steel.